Open Access publishing is about providing free content to readers, making your work immediately and permanently available online for everyone, worldwide. We believe that your journals are differentiated not only by the subject matter and quality of published works, but also by its presentation and accessibility to readers. Therefore, we have designed a platform and developed marketing services that boost journals visibility and significantly enhance the reader’s experience. 1) Open Access Offers Better Visibility Of Your Research And Attracts More Readers – Studies have shown that Open Access publications are downloaded and cited more frequently than subscription-based articles. Exeley brings an added value to the Open Access publishing model by providing various tracking programs that gather the article’s statistical data and offer responsive web design that enables readers to access the content on the go via their mobile devices. 2) Open Access Helps To Avoid Duplicating Studies – The possibility of duplication is increased when access to the published scholarly content is closed and researchers cannot communicate effectively with each other. Exeley provides free access to your publications and provides a wide distribution of the published content across various indexing services and thousands of libraries. 3) Open Access Enables Researchers To Share Their Scholarly Results In A Fast And Efficient Way – The subscription-based model limits publications to countries with a high average GDP. Researchers in less prosperous countries are therefore barred from accessing information. Exeley believes that all scientific findings should be publicly available. Since Open Access triggers new studies more frequently than closed access platforms, our focus is on fast and wide dissemination of the results of scholarly research, enabling more people to contribute to the pool of information. 4) Open Access Helps Boost Economies – Companies often access the newest studies in order to implement solutions proposed by scientists in everyday professional and corporate operations. Exeley welcomes all entrepreneurs seeking the latest research results and provides subscribers with free article alerts regarding newly published content. 1) Open Access Funding Agencies – most countries have specific institutions that found Open Access publications and many universities also designate resources towards Open Access. The first step would be to investigate whether the institution you are affiliated with is able to sponsor your work. Please remember that as a rule, such funding is usually available only to scientists from specific countries. a. SHERPA/JULIET provides the ability to “Research Funding by Country”, which lists the organizations that adopted Open Access policies and require their researchers to provide unrestricted access to their research output. b. UNESCO’s Global Open Access Portal (GOAP), provides additional information on the currently available funding. c. USA - for the updated list of institutions supporting Open Access in the US, it is worth checking the list published by The Massachusetts Institute of Technology (MIT). d. European Union – if you are a citizen of an EU member country you can also check whether you are eligible for sponsorship from European agencies. Register yourself at the European Commission Research & Innovation participant portal to access up to date information on the newest opportunities. 2) Government Donations – the second most popular way of searching for grants supporting Open Access works is to examine the current government policies. Many governments create special scholarships for both journal owners and authors if they decide to publish in an Open Access model. Please check with your ministry of education if you are eligible for extra funding. 3) Individual and Commercial Sponsors – individual and commercial sponsorship is a great way to receive additional funding that can help sustain and develop your publication. Exeley provides you with technology that connects the donation service of your choice (like Donate.ly) directly with your journal’s profile, which makes collecting donations simple and effortless. With Exeley, you also have the opportunity to sell the space that is available on the website and article pages in order to publish sponsor advertisements and banners. 4) Sponsoring Consortium – some institutions gather together in order to support journal transitioning from the subscription-based model into Open Access. Collaborating organizations usually consist of academic libraries, funding agencies and research institutions. Journals interested in participating and making such transition are granted sponsorship and help. Financial aid is also sometimes provided to journals that are already publishing in the Open Access model. Since consortia are usually created for a given subject area, it is important to identify the current opportunities that your journal may benefit from. 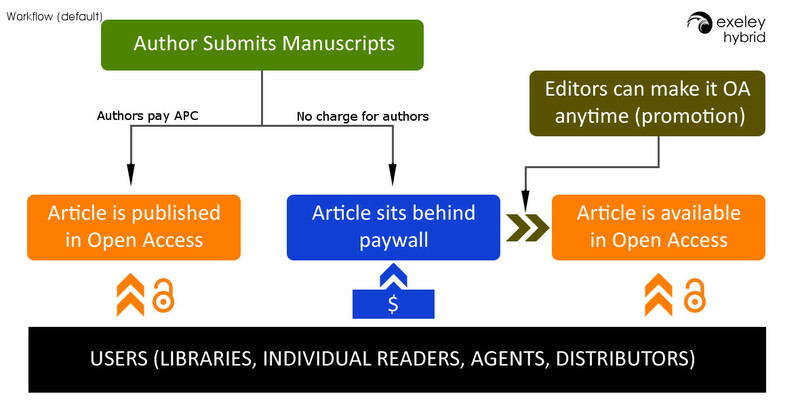 5) Article Processing Charges (Author-Pays Model) – if you are a journal owner, an introduction of APCs might be a great way to fund your editorial work. Before you introduce APCs to your platform, it’s a good idea to check whether your journal will be able to attract authors who are able to pay the costs. For authors from low-income countries, as specified by the World Bank, you may consider APC waivers (in part or in total). 1) Authors - can elect to provide their work in either Open Access or closed, subscription-based format. In the first model articles are made open immediately upon publication, once the article processing charges (APC) are paid for. By paying the APC, authors are also permitted to post the final, published PDF/XML version of their work on a web site, institutional repository or other free public server. 2) Editors - can make any article available as Open Access and manage the revenues from sources such as libraries and full-text distributors at the same time. The model simplifies the organization of subscription earnings and Article Processing Charges and provides also various innovative solutions, such as pay-per-view, advertising space, and donate buttons. With Hybrid Access journals are allowed to continue their traditional model of publication and still remain attractive for authors interested in Open Access.